Last weekend I went to a public forum of the Anthropocene Working Group (AWG). This is a group, mostly of geologists, who propose that the Anthropocene is a new geological era, “an official unit amending the Geological Time Scale.” The working group also includes some ecologists and climate scientists. The AWG will report in 2016 to the International Commission of Stratigraphy, the official body that determines geological periods, for the official verdict on whether the Anthropocene exists and when it began. This was the AWG’s first joint meeting. 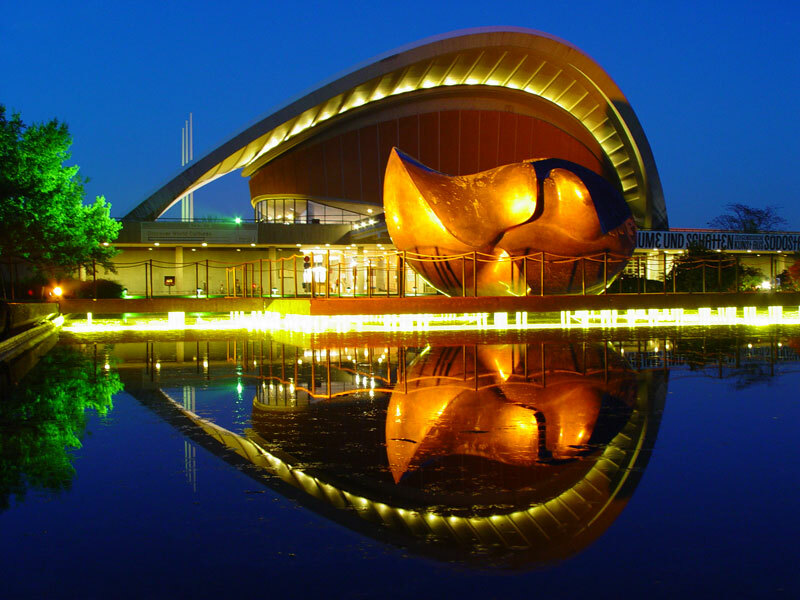 The public forum took place at the Haus der Kulturen der Welt (House of World Cultures) in Berlin. Now a center for modern art, the building is one of many Cold War-era American contributions to what used to be West Berlin. Commissioned by the Benjamin Franklin Foundation (spearheaded by Eleanor Dulles, wife of Eisenhower’s Secretary of State) and designed by Hugh Stubbins, it opened in 1957. Its sweeping roof line overlooks John-Foster-Dulles Allee. It is sponsoring a number of programs on the Anthropocene. The public forum began with a keynote the previous evening by historian of science Naomi Oreskes, who shared the stage with a large tank of turtles. She gave a characteristically brisk and straightforward analysis of the “Great Disruption” (the many anthropogenic disruptions of natural processes since 1950) and a history of the idea of the Anthropocene, pinpointing the Swedish chemist Svante Arrhenius and particularly the British geologist R.L. Sherlock, whose Man as a Geological Agent (1922) proposed a new science of “anthropography.” If we’ve known this for so long, why haven’t we done anything? Oreskes pointed to politics, faith in the free market, and scientists’ belief that the truth will ultimately win. But as she and Erik Conway showed in Merchants of Doubt, being right is no longer enough. The scientists the next day posited various markers and signatures that might indicate the origins of a new geological era. Jan Zalasiewicz, chair of the AWC, pointed out new strata: we’ve deposited enough aluminum foil, plastic, concrete, bricks, and tungsten pen points to constitute new geological materials, and undersea trawling creates new strata under the sea. The transfer of carbon and nitrogen (through widespread fertilizer use) creates new chemical signals, and buildings and cities are creating new trace fossils. (I thought of this when I read this story about Cecil B. De Mille’s movie sets from the 1920s). Subsequent speakers expanded on these themes, with different emphases depending on their disciplines. Geologist Colin Waters dated the beginning of the Anthropocene to the Trinity atomic tests in July 1945, arguing that radiometric isotopes, particularly of Plutonium 239, provide the most suitable marker for the new era. Others argued for the industrial revolution or even the Neolithic revolution as the beginning of human impact. Another geologist, Michael Ellis, looked for connections between climate change and the Anthropocene and found surprisingly little direct impact. He argued that climate lags behind its forcing – in other words that the impacts of CO2 buildup will take years to emerge fully. But carbon itself, he added, has left definitive signals in the atmosphere. James Syvitski explained the impact of dams, agriculture, and mining on rivers and sediment flows, with the surprising conclusion that deltas are sinking four times faster than sea levels are rising. The scientists did a good job of “documenting the spectacle” as one audience member put it. But after three hours of science, audience questions were becoming increasingly pointed: so, what do we do? The final session, titled “Consequences,” let the social scientists and humanists have a say. Unfortunately it was not inspiring. This session included the only women at the forum (two out of 12) and the only person of color (who was also one of the women; to be fair, there are a few more women on the scientific committee). Joyeeta Gupta did more documenting of the spectacle from a political point of view, and concluded that we need a world government and more taxes on the rich. Oreskes offered the best quotation of the day, from Adlai Stevenson: “The trouble with Americans is that they haven’t read the minutes of the previous meeting.” Facts, she reiterated, are not going to save us without action. Historian of science Jürgen Renn gave a wonderful talk on the ephemeral nature of disciplines, the connections of norms and facts, and the need for epistemic communities that are not composed only of experts. Unfortunately I think it went right over the heads of most of his audience. The journalist Andrew Revkin, who spoke last, had been referred to all morning as the person who would tell us where the solutions are, although why a journalist would have this knowledge above anyone else was not clear. His talk was in the event mostly about himself, with covers of 25-year-old magazine articles and even a song he had written about carbon. I left the Haus der Kulturen der Welt, after wandering through some of the many art installations on climate change themes (more documenting the spectacle? ), feeling better informed but not terribly optimistic. Revkin forcefully asserted that next summer’s climate meetings in Paris would once more have little to no result. He is probably right, but I want to do more than sing songs about it.